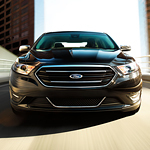 A spacious, comfortable and practical interior has helped make the Ford Taurus one of today’s most popular full-size sedans. When you view a Ford Taurus that’s in our showroom at Mills Ford of Willmar, you’ll have the chance to sit inside and explore many of the interior features before taking your test drive. No matter what the weather is outside, the heated and cooled front seats inside the Ford Taurus can keep you and your companion comfortable. Three different heating and cooling settings can be selected with the push of a button so that you can program the seat’s temperature to your liking. With 12 separate speakers, the Audio System from Sony with Clear Phase is capable of producing excellent surround sound quality. The razor-sharp reception will keep you listening to your favorite tunes and talk radio programming throughout your journey on the road. No static or muffled sounds will interfere with your listening experience.